Indulge in the elegant beauty of Chocolate by Petite Le Vian. With an angled square Chocolate Quartz at its centre, this stunning ring is crafted from sumptuous 14ct Honey Gold and features a floral inspired design set with deliciously dazzling Chocolate Diamonds around the Chocolate Quartz for breathtaking beauty and unique, glamorous style. From ancient royalty to today's red carpet, Le Vian is the couture jeweller of choice. 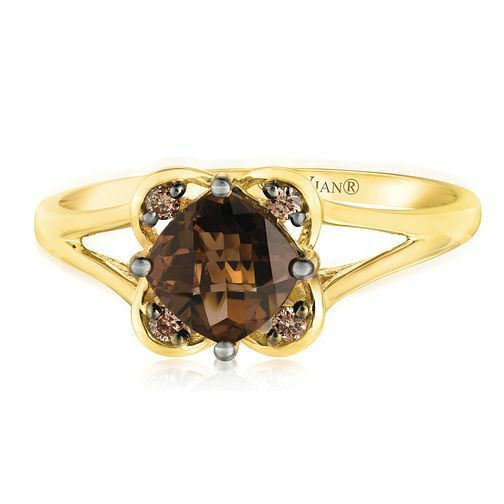 14ct Honey Gold Chocolate Quartz & Chocolate Diamond Ring is rated 5.0 out of 5 by 2. Rated 5 out of 5 by Anonymous from Simply Beautiful As soon as I saw this Ring, I had to get it for my Partner. I'm sure she will love it. She has talked about chocolate diamonds for ages and I cannot wait to see her reaction on Christmas morning. Probably the best "Black Friday" purchase I have ever made.